One of the biggest concerns keeping new business owner awake at night is the question: ‘How will I find clients for my new business?’. In fact, this question can become so much of a concern for some new business owners, that they never get their business started at all! It’s an understandable worry, as without clients you don’t have a business. But don’t let this fear hold you back – finding clients is never a problem, as long as you know the steps to take (which we will look at in this post), and you remain consistent in your marketing efforts. How does your product or service ease their pain? When starting a new business, you need to consider not just what you want to offer, but who you want to serve. In other words, who are your dream clients? That’s one of the great things about running your own business; you get to choose what you do and who you work with. That means that everyday you can be working to help exactly the people you want to help, which is both motivating and fulfilling! Once you have defined who your dream clients are, you need to get to know as much about them as you can. There is no such thing as too much information when it comes to your ideal clients! : Where are they based geographically? : What concerns keep them up at night? : What passions would have them searching the Internet all night? : Where do they get their information? : Where do they hang-out online? Once you’ve collected as much information as you can, see if there are any patterns, for example, do your dream clients fall into any distinct groups? How do you help your dream clients? Once you are clear about who your dream clients are, you need to think deeply about how your new business helps them. What concerns or pain points do they have that one of your products or services solves? How is your solution different to other solutions available? Or is it completely new and unique? Don’t skip this stage or guess your answer. When it comes to business, assuming you know what your clients think, feel, want or need can be a costly mistake – both in terms of time and money. You may need to do some industry or competitor research to help you here. You may find you need to do some additional market research too. It’s important to be 100% sure that your product solves a problem that they care enough about to pay for your unique solution. Once you know who your dream clients are and how you ease their pain, you can then work on developing communications that are highly targeted and focused – and therefore have the right impact! Where do your dream clients hang out? You should already know this from your customer research. Now is the time to start hanging out with them to share your message about how your product helps them. At this stage, it’s wise to remember the dating principle. You wouldn’t propose marriage to someone on a first date, and the same is true when it comes to your sales conversations. Before you can ‘pitch’ your product to your clients, you first need to get to know them, build trust and credibility, and gain their permission. This can take some time, so be prepared for this and make an appropriate marketing plan. You need to start by becoming more visible to your dream clients, raising their awareness that you and your business exist. Go to the networking events they attend, advertise or get featured in the media they consume, be active in the social media groups they belong to and so on. Once they become aware of your presence, you can spark their curiosity and lead them to your background information – things like your website, social media presence, blog or videos. These all need to reinforce your unique position and introduce your clients to the benefits you can offer them, building your credibility and starting the client relationship by allowing them to get to know you. It’s important to be authentic and consistent across all your communication platforms so that your prospective clients can get to know the real you and feel reassured by your consistency. Once you find your dream clients you will often find you need to go on several ‘dates’ with them before they are ready to buy. This is normal shopper behaviour, as only a small percentage of people in a market are ready to buy at any one time. Develop a clear communication and marketing plan that puts you in front of your audience on a regular basis. This needn’t be anything too sophisticated, but consistency of both message and presence is key. It’s important to have some way of capturing the contact details of the people who seek you out, so you can stay in touch with them and nurture the relationship. Having a free information product – an eBook, checklist or webinar for example – is one of the best ways to do this. Offer them something valuable in exchange for their contact details. Be sure to include a clear Call to Action in all your communications so your prospective clients are always aware of what you offer and how they can work with or buy from you when the time is right. Oh, and you’ll often find that your first clients are closer than you think – so don’t forget to let your friends, family and existing network know about your offer. Starting out in business for the first time is an exciting time – but with so much to learn and do it can feel overwhleming. And trying to work out what to focus on first often causes fear and anxiety. But it needn’t feel that way. My 90-day private business coaching program provides new business owners and entrepreneurs, with the personal support and guidance they need to develop a clear Business Blueprint that will breathe life into your business idea and make it a reality – step-by-step, avoiding the confusion or overwhelm. With my expert guidance, tuition and personal time and attention, this clearly structured, yet flexible, program will help you create your own business blueprint, so you can start a business you love that delivers the results you desire, using methods you enjoy. It’s the fastest way to build and launch start earning an income from your business. To learn more about the program and discuss your business, contact me today to book your free 30-minute Discovery Call. Such great advice about finding out the pain points of your potential customers.. this is such a valuable suggestion. And your coaching program sounds wonderful. 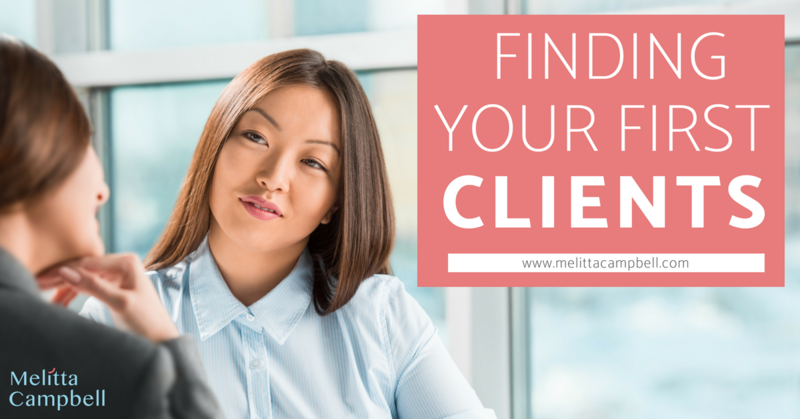 Thank you for the tips on how to find my clients! Thanks so much for the excellent advice!!! Now its time to get those dream clients. Great detail and advice… It feels so overwhelming at first and your advice really helps! I’m so glad you found the tips helpful Lisa. It’s easy to feel overwhelmed as a new entrepreneur – the key is to go back to your goals and purpose, and break things down to get your perspective back. It’s all doable, and it’s the little actions done daily that will add up to a big difference.